Two buses brought the Jes rowers down to the University of Limerick's Sports arena, leaving the club at different times (6am and 7:30am), to get rowers to the venue in time to warm up properly, before their scheduled races. The configuration of the room was slightly different this year, with two blocks of approximately 24 ergometers (rowing machines), arranged in three rows, each facing the other block of ergs on the other side of the room. This gave the spectators on the tiered seating a view of each rowers side profile. As usual, large screens behind each block of ergometers displayed the names of the rowers and, during races, showed how that race was progressing. In a fine display of talent, the Jes brought home both junior 18 gold medals. Caoileann Nic Dhonncha won the womens's 2km race, taking the lead from an early stage, and Ciara Walshe won Silver in the same race. Later that day, Caoileann and Ciara came 2nd and 3rd, respectively, in the WJ18 500m sprint. 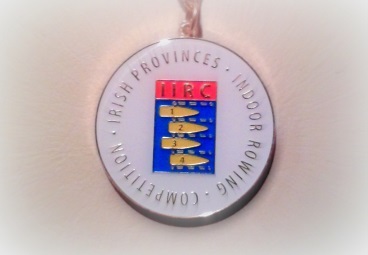 Mark Ryder set a personal best time on the day, covering the 2k in a time of 6 minutes 29.8 seconds, which secured him the gold medal in the most competitive of the indoor rowing categories. Congratulations to Sam Reidy, who won silver in the J16 (2km) category. Sam was also the joint-winner of the J16 500m sprint, later that day. Oliver Kelly tied for first place in the mens J15 1K race, with a very impressive sprint finish. Aaron Burke won bronze in the same race. Congratulations to Tom Maye, who came 3rd in the J13 500m race. He narrowly missed out on the bronze medal in the 3-minute piece, being only 4 metres behind the top 3. The relay is over 2k, and each team of 4 can break down the piece in whatever way they like. Generally they do 20-30 stroke bursts but they could elect to sprint 500m each - it's completely up to them. Two of the team hold the current rower's feet to the rowing machine, the other shouts encouragement as they wait to take over. The handover involves the next rower taking the handle from the current rower and jumping onto the erg as the other rower jumps off the other side. 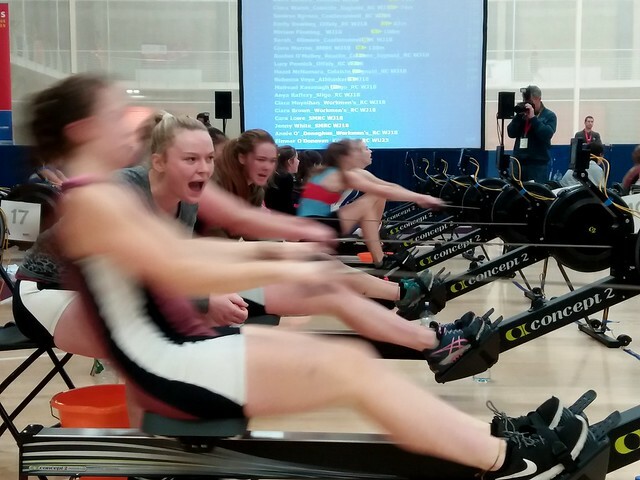 The 5th Year Team of Rachel O'Malley, Caoileann Nic Dhonncha, Róisín Gavin, and Hazel Macnamara, and the 4th-year team of Isabella Gannon, Elise Carney-Frasier, Róisín McGrath, and Ellen Forde both won the races in their categories. The Women's year three relay team came 2nd in their race, by four seconds. Thomas Hume, and Ruairi O'Gorman came 4th and 5th, respectively, in the J16 2K race. Caoimhín Conway finished 6th in the MJ18 2k race, having achieved a personal best time of 6 minutes, 46.1 seconds. Mark Ryder finished 5th in the MJ18 500m sprint. Muscle fatigue from winning the 2k race, earlier, left him 3.7 seconds off the pace for the podium.